We inhabit a fictional country. The photograph lies. EMBAJADA DE GALES means ‘Embassy of Wales’ in Spanish. 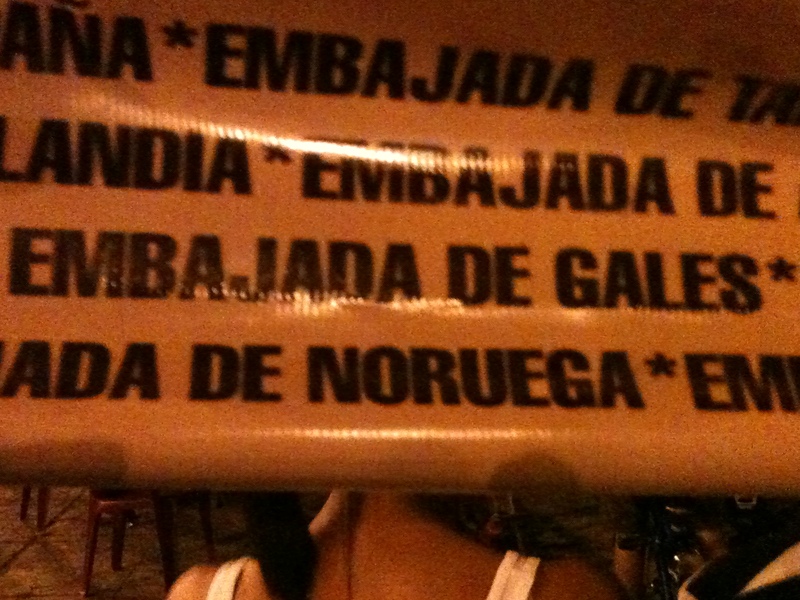 It was on a banner displaying the sponsors of a poetry festival in Central America. Reference to such an entity proves beyond all reasonable doubt that we come from an imaginary country, something like Ruritania. But what, I ask you, gentle reader, distinguishes a real country from an imaginary one? When I was last at Buenos Aires airport in 2005 there was a huge display in the arrivals lounge announcing ‘Argentina – un país de verdad’ (Argentina – a real country). This was not long after the collapse of the Argentine economy and the massive devaluation of their national currency. Who, other than those in a state of serious self-doubt, needs to proclaim to the world the status of their own reality? Argentina needn’t have worried. But we in Wales are used to such a predicament. We are never sure whether or not people in the rest of the world believe in us or not, so we are permanently checking our self-made reality gauges. It is well-documented by academics that the Welsh are sociolinguistically more Welsh the further they travel from Yr Hen Wlad. There is even a Welsh proverb to that effect. But does that mean we become less fictional when we travel, or more? In most of the world, if they have heard of us at all, we are ‘a part of England.’ I have also heard that Wales is ‘in Scotland’, and on ‘the other side of Ireland’ and once ‘in Finland’. These assertions, while showing a frail grasp of geography, do in fact have a whiff of the truth, placing Wales somewhere on the periphery of something else. Frequently of course, there is a situation where an individual Welsh celebrity has raised international awareness of our existence. A footballer – Mark Hughes in the 80s, followed by Rush, Giggs and now Gareth Bale – will assist bar-room conversation. In rugby-playing nations a Welsh identity usually provokes commiseration, and pitying remarks of how a once-proud team can now only compete in the second tier. Richard Burton, Anthony Hopkins, Tom Jones, Shirley Bassey, Catherine Zeta Jones and Charlotte Church have done their bit. Among literary types (other than specialists) only Dylan Thomas ever seems to pop up. While no one has yet suggested to me (as apparently George W Bush did) that Wales was one of the states of the USA, our provenance and exact status remains a mystery to the great mass of the world’s population, but our invisibility has one overriding benefit: no one has had the time to form a negative impression of a place they have never heard of. To come from a land with nominal but invisible embassies, with a government but without a constitution or a state, with a fictional creature on its flag and a population whose sense of national identity grows in direct proportion to distance from the homeland, now that is what I call a wondrous paradox. We are the ghouls of historical destiny, forever seeking ourselves in the space left between a phantom nationhood and other people’s perceptions of us. All compounded by the concept of everlastingness – Cymru am byth – so that when all the planets have been sucked back into the sun, when the dust of what was once our solar system is distributed at random across the vast wastes of the universe, the idea of Wales will live on. Brilliant!!! for once a reasonable voice!! I also agree that wales isn’t a nation, BECAUSE it doesn’thave a representation at teh UN< an own currency, code of law, and especially because it has to bend over to that other countrry wehich – oddly enough – isn't a nation either!! ahahahaha!! whoever would have said! Yesterday I applied for a job with teh governement of wales at teh Sebnedd; and one of the questions isL: what nationality are you" followed by a tick box with welsh/english.scottish"…. I rest my case….. I could argue that a country is any place distinguished from another, ethnically, while a nation has to be defined by the United nations and has to fullfillsome requirements, such as oen currency, government with legislative powers, language (especially language) code of law and so on and so forth as defined by the UN; recognized by the UN. Anyone can rant about being a great nation but if it hasn’t embasises abroad and all that, it only counts as self delusion; or perhaps oit is good to have someone else to blame? so rejoice because even though Cymru isn’t a nation, nor is Lloegr! or Scotland for that matter….